These green bean “fries” are nearly addictive as a snack or served along with sandwiches. In a medium stockpot, bring 3 inches of salted water to a boil. Add the green beans and cook for 3 minutes, remove from heat, drain and immerse in cold water to cool. Drain and set aside. In a small bowl, combine the breadcrumbs, Parmesan cheese and oregano with the onion and garlic powders. In a wide bottom bowl, blend together the eggs and milk. Place half the flour on a wide plate, and half the bread crumbs on another plate. Working in small batches, place green beans in the flour and coat well. Remove the beans from the flour, shaking off any excess, and place them into the egg wash and coat well. Use a pair of tongs to remove the beans from the egg wash and place into the breadcrumb mixture. Coat well with bread crumbs and place the coated beans onto a large baking sheet in a single layer. Repeat the steps with the remaining beans. Bake the beans for 18-20 minutes until crisp, remove from the oven and serve, garnished with fresh lemon zest. 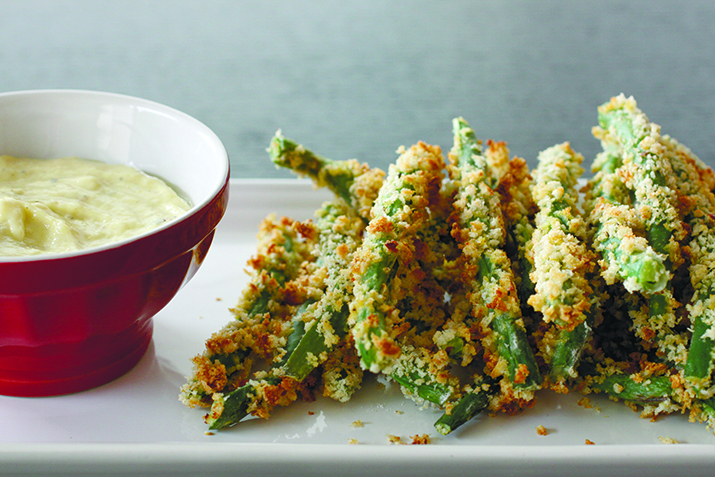 These green bean “fries” are nearly addictive as a snack or served along with sandwiches. Kids love them with creamy low-fat dressing as a dip.